Jeremiah Wright, Art Thou Right?? | Thoughts of a Calabarboy. Jeremiah Wright, Art Thou Right?? – Thoughts of a Calabarboy. Jeremiah Wright, Art Thou Right?? Some people get popular for what they have done and others for what they didn’t do. Some for what they said and others for what they didn’t.Still yet some get renown for what we make of them. I can confidently point to individuals who fit into these groups, but I hardly knew anyone who covered all until the press came along and created out of one man a multiplicity of roles. Jeremiah Wright paints the image of one who the press feeds on so as not to go story bankrupt or should I say misinformation bankrupt. Its as though the life wire of the American press is creating controversy out of little contraptions that have no implication whatsoever on public life. Of what value is the discussion of Jeremiah Wright and his speeches in the decision of who leads American if the face of a dwindling superpower status? Absolutely nothing!!! However the press has found something appealing to human nature and are bent on romanticizing with this until more a storm from a tea cup becomes a ferocious land sweeping tornado. 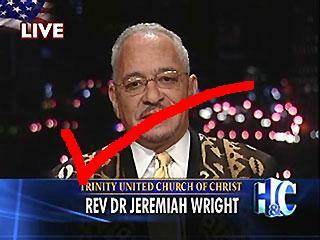 But wait a minute, on this Jeremiah Wright we are all so engaged about, how many American know him? How many people apart from Barack Obama attend his church and have sat under his supposedly polarizing influence? On how many TV stations around America does he feature? Has Barack Obama ever mentioned that he was a political adviser to his campaign? So how then does his opinion matter? I thought the press were meant to report on objective issues that build positive values in society. But I am seeing the American press feed fat on the contradictions within soceity they are meant to help heal. Jesus during his earthly ministry made a controversial comment like “whoever does not hate his father or mother, cannot not follow me…” I am wondering if that was all that people heard about his message, would he have the largest followers which He commands today? As soon as I heard the little visual piece played by CNN over and over again, I immediately knew that for the next weeks that’s was all we are going to deal with and this has become true. Barack Obama has all of a sudden become the student and protege of Wright and will necessarily operate under the command of Wright. Silly…very silly. The media reports that many people say that Obama is not talking about the issues. Yet every time they encounters Obama, they don’t ask about the issues, they talk about how right or wrong Jerry Wright is. for instance Obama and Hillary has spent time in Indiana and N/ Carolina address their policy positions, but the press is not highlighting that, rather it is Jeremiah Wright and his speeches that matter. I wish I could format the hard disk of the American Press and provide a tabula rasa for genuine media to outflow. My candidate Hillary has said she wouldn’t have sat in Jerry’s church after hearing such comments. Can I ask her if she goes to church at all in the first place and belong to a church family? If she does and will do as she says, then she is a big traitor of family ties and not worthy to be within that family. Because we all know that it’s not all the time that you have sweet talk in your family. sometimes you have the bitter ones and that’s not enough reason to eject yourself from it. So she should rethink her political position, because it would not earn her any respect. finally, Jerry, you said some harsh things ohhh i don’t argue. But I put it to you you are free to say what you think and express your views whether right or wrong just as Lou Dobbs blabs all the time, Jesse Ventura, John Hagee, e.t.c You are accountable to God if you are dividing America with your teachings as we all are also accountable to God. Your views are just your views and has little implication for America. Only God’s position on America matters most to us all and I wish the press could get a hold of that. → Is he the one or do we look for another?? Dag nabbit good stuff you whippearsnppers!